Today is the third Sunday of Easter. And yes, even though you will no longer find chocolate bunnies for sale at Safeway, it’s still Easter! And it will continue to be Easter till we reach the feast of Pentecost on May 20. As you may have noticed, there are various ways that we mark this joyous season in our worship. We use vestments of white, which in Western culture are considered festive. We burn a very large white candle. We read the Acts of the Apostles in place of the Hebrew scriptures for the first reading. We include extra Alleluias at various places in the service. And finally, the Confession of Sin is optionally omitted. During this joyous season, we pause for 50 days to ponder a single day, the Day of Resurrection, and to consider its consequences for us as disciples of Jesus. 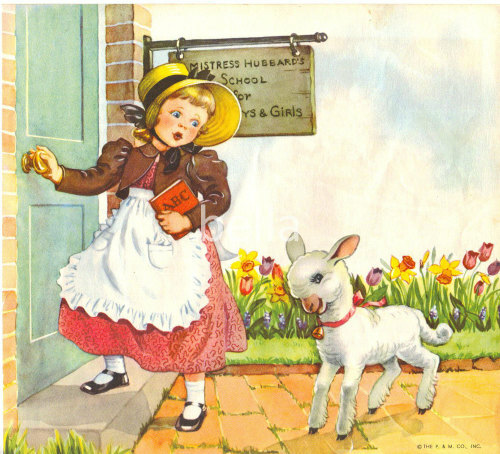 That explains why, for the third Sunday in a row, we hear a story from that first Easter Day. 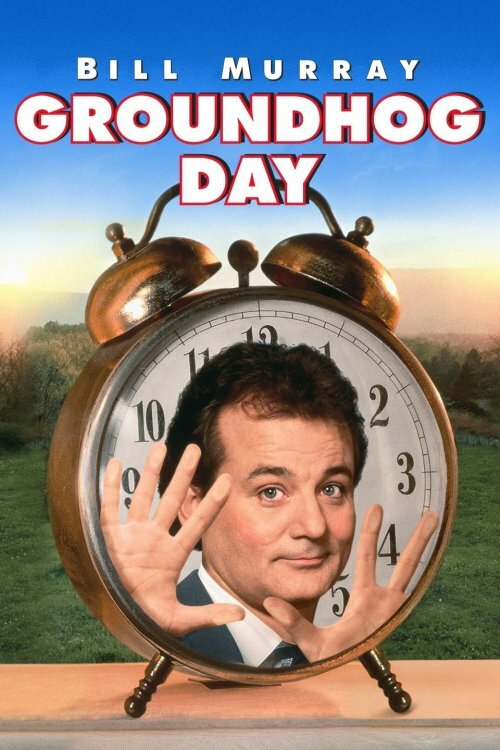 It’s kind of like the movie Groundhog Day, in which Bill Murray’s character experiences the same day over and over again till he learns his lesson. Likewise, we will move on from Easter Day only when we have learned all that we need to learn from that eventful day. You may have noticed that I did not read the last two sentences of the Gospel reading, as printed in the lectionary insert. It was not an accident due to Holy Week exhaustion; I omitted them because they are not, in fact, part of the canonical Bible. The original version of Mark’s Gospel ended with the words, “They said nothing to anyone, for they were afraid.” The end! Now, the early Church didn’t like this abrupt cliffhanger of an ending, and two different appendices were proposed in order to give the Gospel a more satisfying ending: the so-called “shorter ending,” consisting of the two sentences in the insert that I didn’t read; and the “longer ending,” consisting of verses 9 through 20, as found in modern printed Bibles. Very early on, you see, the Church had decided to go with the longer ending, and those two sentences tacked on to the end of verse 8 were scrapped. Unfortunately, an editor at Church Publishing Incorporated seems not to have gotten the memo! With that out of the way, let’s look a little closer at the eight verses that I did read. We are told that three women got up at the crack of dawn on a Sunday to ready Jesus’ body for burial. He had been so hastily entombed that his body had not been washed and anointed with perfume, as was the custom. According to Jewish belief, the soul of the departed lingered for three days after death. So, they would have believed that Jesus’ spirit would have been aware of the fact that they were lovingly fulfilling their duty as members of his unofficial extended family. The women clearly put some thought into what they would need. The story mentions how they went out and bought aromatic spices in order to perfume the body. But they forgot one rather important fact: the tomb was sealed with a very large and very heavy stone. It is only as they are walking to the tomb that they remember this little detail. They don’t have a team of strong men with them. They don’t even have a crow bar. And the chances of success are pretty minimal. Now, reasonable people would have turned back at this point and rounded up a work crew. But the three women do not, in fact, turn back. They just keep going. Were they being foolish? Or did they just have faith? Some 2000 years ago, in a backwater of the Roman Empire, something happened that changed the world. On the first Good Friday, Jesus of Nazareth was executed on a cross. 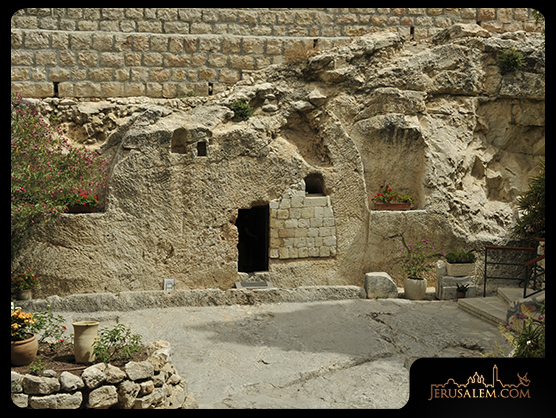 On the first Holy Saturday, he was buried in a borrowed tomb. And then on the first Easter Day, he was raised from the dead, as a sign of God’s love for his Son—and for us. For we are told that if we have faith in God’s saving love, we too will be raised from the dead. That in a nutshell is the Easter message. But faith is such a tricky matter! If we watch the news coming out of Syria or Egypt or Russia or Sweden, it is ever so easy to believe in Good Friday. It is easy to believe that the world would torture and kill a gentle man whose only wrong was to teach God’s love. It is easy to believe the Holy Saturday message that this man of peace lay dead and buried. But it is harder to believe in the Easter message, that sin and death did not—and do not—get the last word. We may imagine that ours is the first generation of doubters, but that just isn’t the case. St. John wrote the Gospel account of the Resurrection that we heard proclaimed today for one reason and one reason only: that doubters of every generation might know the truth about what God did on that first Easter Day and, believing that truth, might have eternal life. Of all the Gospel accounts of the Resurrection, John’s is the most vivid and detailed—and the most convincing! In the midst of the miraculous, we get real, believable portrayals of how various disciples of Jesus reacted both to his death and to the mystery of the empty tomb. 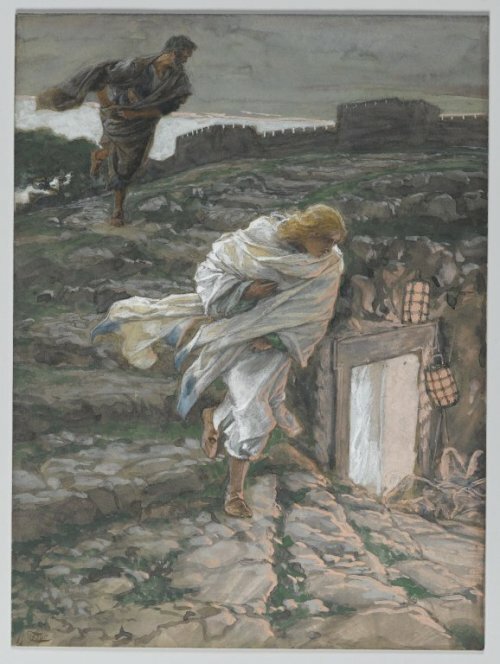 The two boys, Peter and the Beloved Disciple, upon hearing that Jesus’ body has gone missing from the tomb, compete in a footrace to see who will get there first. The Beloved Disciple wins, but then chickens out, letting Peter be the first to enter the empty tomb. The Beloved Disciple believes, even though he doesn’t understand, while Peter is just plain confused. The impatient boys head home. And because of their impatience, they miss out on a miracle. Some 2000 years ago, in a backwater of the Roman Empire, something happened that changed the world. On the first Good Friday, Jesus of Nazareth was executed on a cross. On the first Holy Saturday, he lay buried in a borrowed tomb. And then on the third day after his death, the first Easter, he was raised from the dead, as a sign of God’s love for Jesus and for us. For we are told that if we have faith in God’s saving love, we too will be raised from the dead. That in a nutshell is the Easter message. But faith is such a tricky matter! If we but read the newspapers or watch the news coming out of Syria or Turkey or France or Belgium, it is easy to believe in Good Friday. It is easy to believe that the world would brutally kill a gentle man whose only wrong was to teach God’s love. It is easy to believe the Holy Saturday message that this man of peace is dead and buried—The End! But to be honest, it is harder to believe in the Easter message, that sin and death did not—and do not—get the last word! We may imagine that ours is the first generation of doubters, but that just isn’t the case. St. Paul contended with his fellow Jews trying to convince them that the Resurrection of the Messiah was foretold in scripture if only they had the eyes to see and the ears to hear the truth. Later, St. John wrote the Gospel account of the Resurrection that we heard proclaimed today. He wrote his Gospel for one reason and one reason only: that all generations might know the truth about what God did in his day and, believing that truth, might have eternal life through Jesus Christ. Of all the Gospel accounts of the Resurrection, John’s is the most vivid and detailed—and convincing! In the midst of the miraculous, we get real, honest portrayals of how various disciples of Jesus reacted to his death and later to the mystery of the empty tomb. 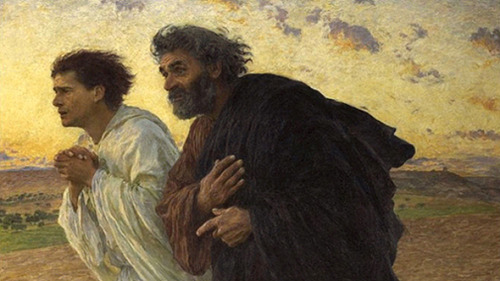 The two boys, Peter and the Beloved Disciple, upon hearing that Jesus’ body has gone missing from the tomb, compete in a footrace to see who will get there first. The Beloved Disciple wins, but then chickens out, letting Peter be the first to enter the tomb. One disciple is forever changed; the other is merely mystified. The Beloved Disciple believes, even though he doesn’t understand. Peter is just plain confused. The impatient boys head home. And because of their impatience, they miss out on a miracle (at least for now). Easter Service, Sun. 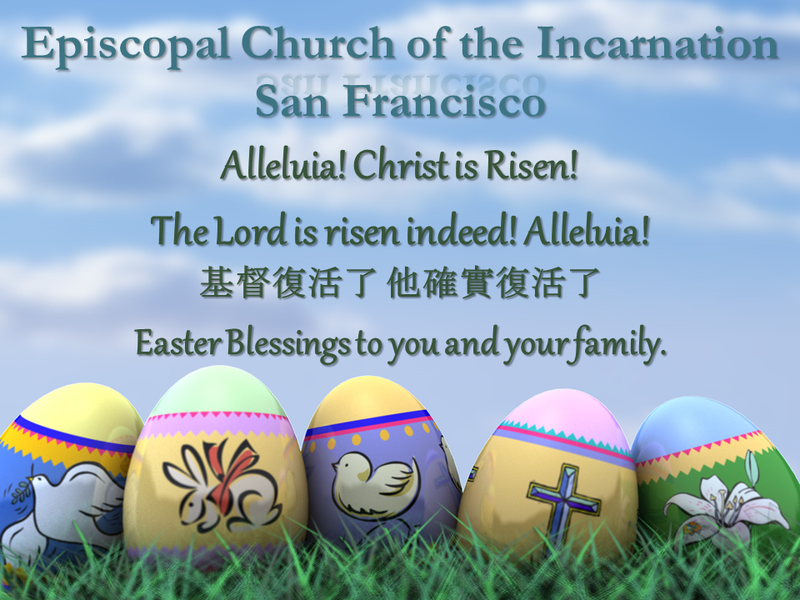 March 27 at 10 a.m.
Easter Service: Sun. 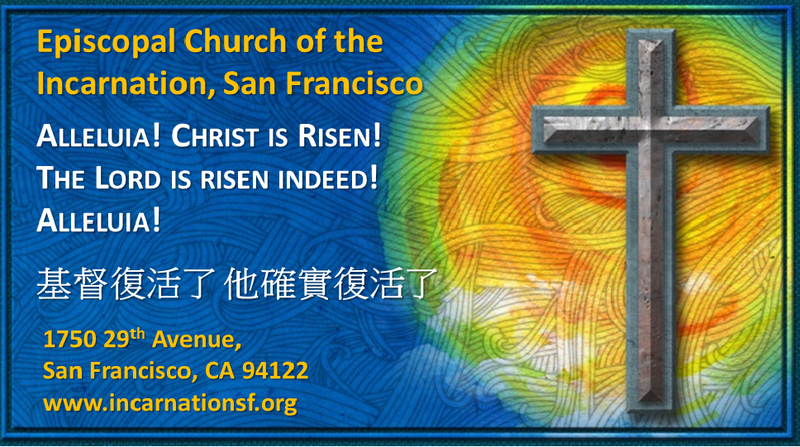 March 27, 10 a.m.
Easter Day is the greatest feast of the Christian Year. This is a time of great celebration as we rejoice in our redemption. Join us in the joyous celebration. The service includes special music followed by a festive reception. In the Name of the Father, and of the ✠ Son, and of the Holy Spirit. Amen. Today is All Saints’ Day, a “principal feast day” in the liturgical calendar of the Episcopal Church. 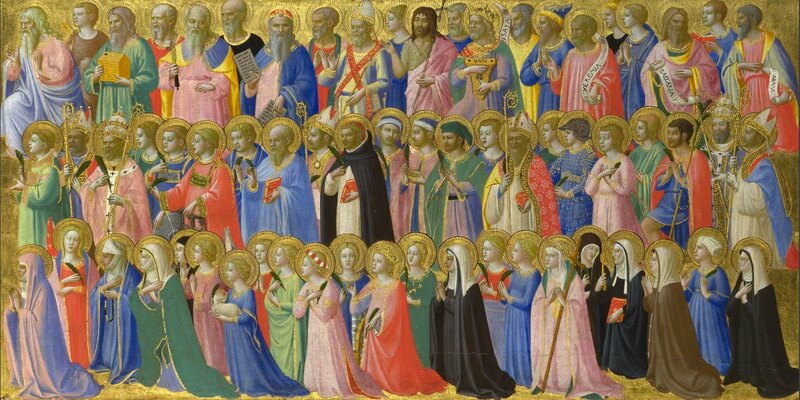 And so, here we are, gathered together to commemorate all the saints. But what exactly do we mean my the word “saints”? 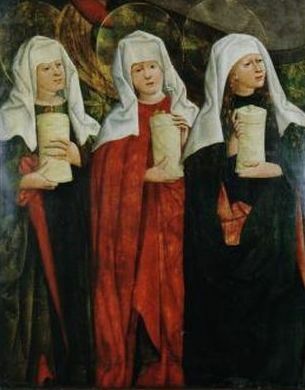 In the early church, all baptized Christians were called saints. All were considered holy. All were considered set apart for God’s use. Only later did the term become limited to those who had lived lives of heroic sanctity and, most especially, those who had crowned their lives as martyrs to the faith. As a result of this change in connotation, the remembrance of the “unheroic” faithful was put off to the following day, the feast of All Faithful Departed, more commonly known as All Souls’ Day. Frankly, I prefer the earlier usage. I like to think of this day as a day to remember all the faithful of ages past, whether or not they were particularly “heroic” in their faith. But this feast day is not just about looking backward. This day is also a day of looking forward. The prayer book designates this feast as one of four baptismal feasts, at which we dedicate new saints to God through Holy Baptism and at which we may optionally renew our own status as saints by solemnly reaffirming our baptismal vows. Truly, this is a day to remember all the saints—past, present, and yet to come. 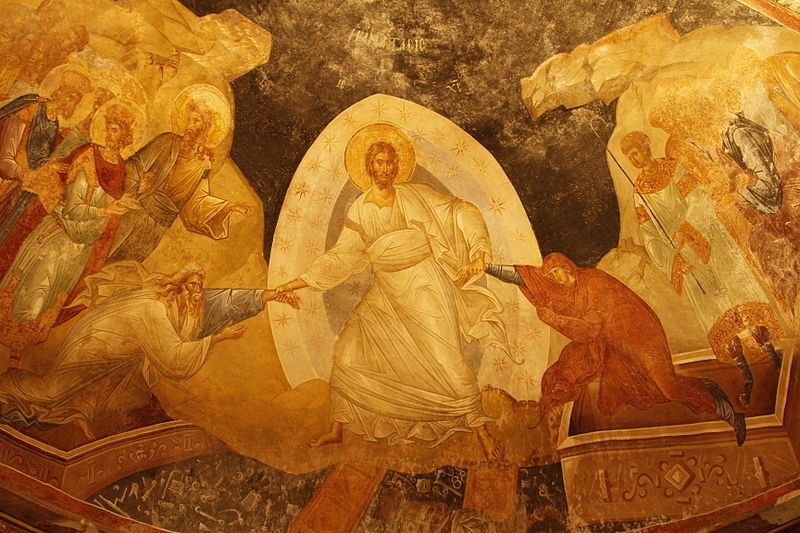 In Harrowing of Hades, fresco in the parecclesion of the Chora Church, Istanbul, c. 1315, raising Adam and Eve is depicted as part of the Resurrection icon, as it always is in the East.